How I get some of the metal effects on my models is a question I receive more often than not. 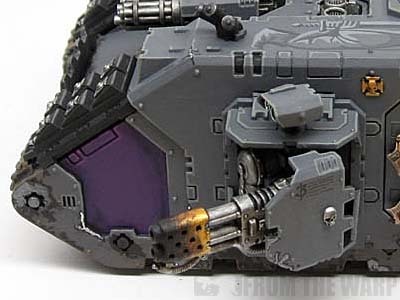 There was a huge response to the post I did the other week about adding contrast to your metallic power weapons which is one of the tricks I use. I thought I might take a minute and look at some of the other methods I use to alter my metallics to get a number of different looks. I suppose I should start by saying that this pertains to silver or regular metal as the base. Golds and such would be another post as there are a ton of ways to do them as well. When it comes to using a color for the "base," I used to use GW Boltgun metal. We all know what happened to that love of our lives. Now I use GW Leadbelcher. After going through a handful of metallic paints, I found that one to have the qualities I enjoyed working with the most. How do you start and where do you go? I start by getting a nice base down of the metallic color. You want nice and smooth without streaks or imperfections. This part is important since we are going to build on this from here on out. Then the question becomes, what do you want to achieve? I'll go over some of my more common effects that I use. These aren't the only ones out there, but they're the ones I use most of the time. One of my absolute favorites. Even though it's applications are limited, it's the perfect solution for those particular cases. Full tutorial here. This effect is done by repeated washing with GW Nuln Oli and GW Agrax Earthsahde. More of the black than the brown. You will build up and darken the metal substantially as you go along. 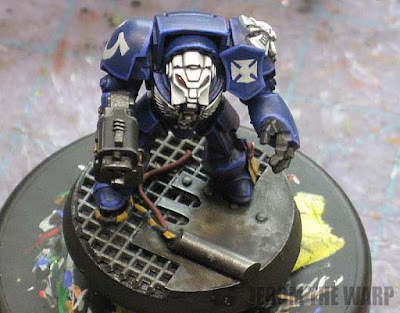 If you really want dark, you can try thinning down some black paint and using that as a wash.
You will get the the point where using your original basecoat to highlight will look almost too bright. This is something I do when I want to show metal that has a substantial amount of grime that's built up on the surface. 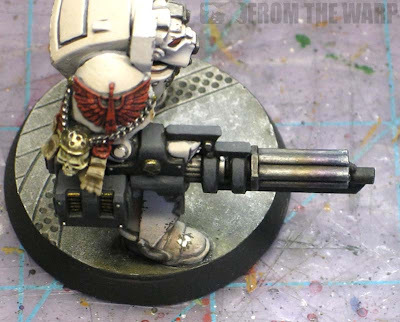 This is an easy trick that adds a nice touch of realism to your gun barrels. Especially flamer muzzles. It's done with paint so there's nothing fancy you need to have either. This is one I use if I don't want my gold to look new and polished. Starting with your normal metal, it's a series of washes using GW Seraphim Sepia and GW Agrax Earthshade. I use the Sepia all over and the Earthshade in the recessed areas for contrast. It takes a few passes, but the effect is that of gold that has not been kept up over time and has collected some grime across the surface. 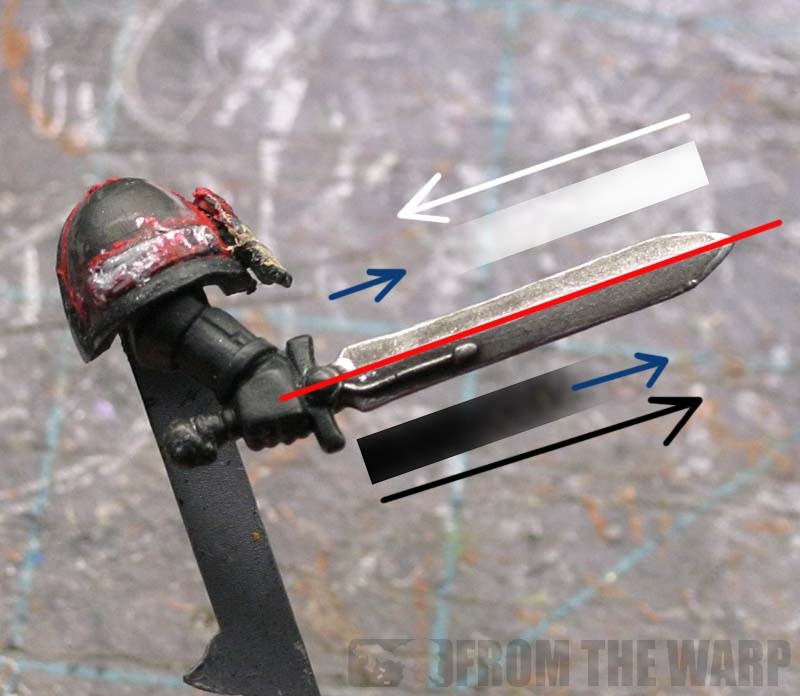 I like this on Chaos models. We often forget that races other than Space Marines use metal. The addition of some metallic on Eldar models in a few key places can really make them stand out. In this case, I opted to use a green wash to give the pulse lasers a more Xenos feel instead of the standard metal look similar to what you might find on an Imperial Titan. These can be accomplished using any color wash to be quite honest. You can use Carroburg Crimson or Reikland Fleshshade for hydraulic fluids. 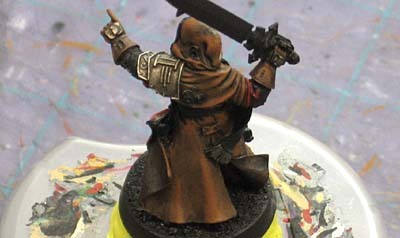 You can use Agrax Earthshade or Seraphim Sepia for oils. You can use Biel-Tan Green or Drankenhof NIghtshade for any other non-descript chemical spill. I love this look for creating military ship deck surfaces. 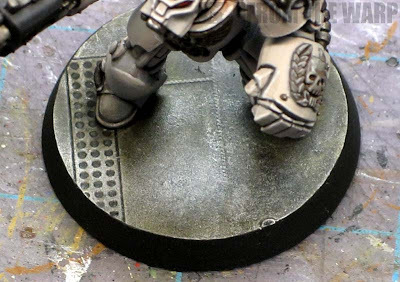 The introduction of the olive drab coloring really makes it stand out from the normal black wash we often see on Space Hulk style deck bases. This one requires two specific washes and some drybrushing, but the effect is incredible. Full tutorial here. This is one I posted recently that I'm including here as well. While it's more about contrast than it is about getting your metal to look like something else, I figured it was worth including. Full tutorial can be found here. These just happen to be the ones I use most of the time in my painting. There is so much you can do to a basic coat of metal to bring it to life. Just the addition of a second wash using a different color can change to look completely. Adding a little bit of variety to your metals can't hurt. Very rarely are things the same color all the way across. By adding some variety, you can really bring your models to life. Quality stuff Ron as always, effects like this set models off perfectly in my opinion. I'm waiting to finish off a chaos dwarf blood bowl team before I can try out the power sword effect tutorial. Can I also make a request? You do some excellent weathering with powders but is the effect achievable with just paint? I would love that! Really great stuff Ron, very handy tips all in one place. ieuan: Thanks. 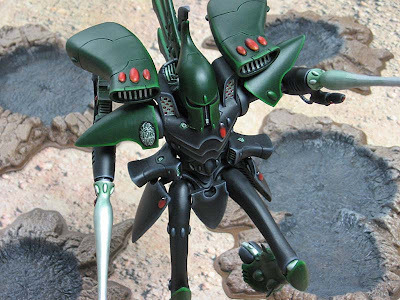 As for your question about paint replacing powders... not really there are some things you can do that mimic powders, but it is very hard to get that same "feel" to a model. Some effects require powders to be done well just as some effects require washes, glazes, wet blending, etc. I can show you the few things I do when I opt not to use powders though. That's certainly possible. Klaus Schächner: I do the same thing with my gold as well. I like the look that green gives it and sometimes use that as my base color. Tommy Clark and Sendraks: Thanks guys! thanks ron, incredible collection of tips, now I have to put them to use. Werner Fernando Oroxon Ramirez: Glad they help. The new archives are set up in a s similar fashion now. Instead of just one article on a topic, you'll get links to a few that touch on that topic. Perfect timing - I'm painting up some Orks and their weapons are way to clean for the time being. Bring on the brown and black! That old and dingy gold is just awesome! I don't really like models with a pure gold jumping on you from the woods with all its shine, so this might be just what I need. Psish: Thanks! For me, that dirty gold fits more with the feel of 40k than the super bright stuff does. I love the gold recipe. I just tried it. Saved me buying a brass colour and it looks much nicer. Thanks! Cameron: Very cool, glad it worked out well. I'm wondering what color base coat you would use on the "Grimy metal that hasn't been cleaned recently" dude's shoulder pads? (sorry, I'm a newb and don't know the name of the miniature). JH: Thanks for the question. 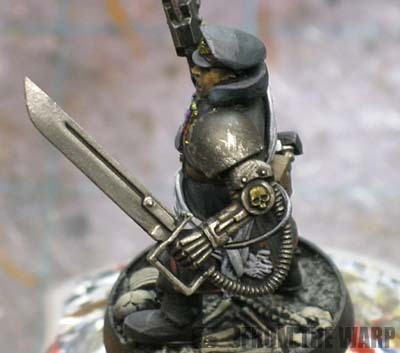 The model is primed black and basecoated with GW Leadbelcher. You could get away with using just about any metal, just make sure you have a nice, smooth finish to work over before you start your shading.